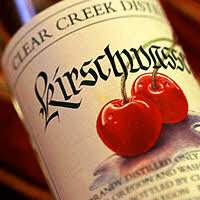 A type of German brandy made from cherries, also known as "kirsch" for short. Its name literally translates as "cherry-water" in English — and sure enough, kirsch is usually colourless rather than red (although artificially-coloured varieties do exist). Trivia fact: it usually takes over 20 pounds of cherries to make a single bottle. 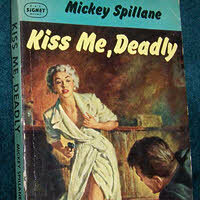 1952 pulp detective novel by Mickey Spillane, featuring his famous anti-hero — tough-as-nails private eye Mike Hammer. The plot features the requisite amount of murder, intrigue and a Maltese Falcon-esque pursuit of a mysterious artefact. Made into a film in 1955, which is regarded by aficionados as one of the definitive examples of film noir. 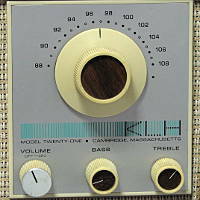 American manufacturer of a well-regarded series of FM radios, speakers and turntables in the 1950s and 60s. The company name was derived from the initials of designer Henry Kloss and his business partners Malcolm Lowe and J. Anton Hoffman. Originally based in Cambridge, Massachusetts, the company has been bought and sold several times over the years. Now based in California, they produce modern electronic audio products such as CD players and iPhone docks. A yoga term referring to a form of "corporeal energy". 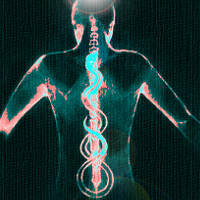 Kundalini is typically represented by a sleeping serpent coiled at the base of the spine — in fact the word itself is a Sanskrit word meaning "coiled".